We report experimental and theoretical evidence of a non-Rydberg molecular doubly excited state of Ca2 involving excited molecular orbitals mixing 4p and 3d characters. 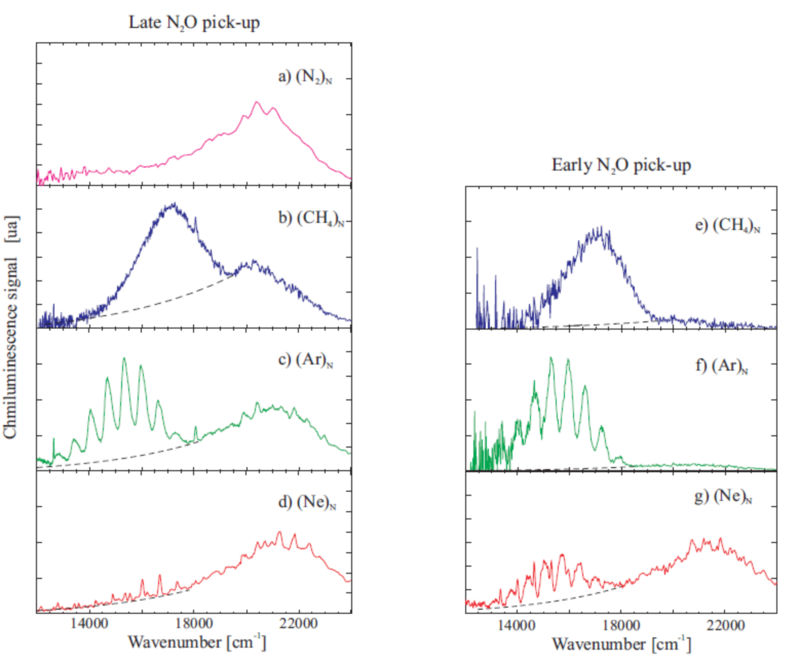 The excitation spectrum of Ca2, carried by helium or argon clusters, is recorded experimentally in the range 25 600–27 800 cm−1, displaying a bimodal structure. 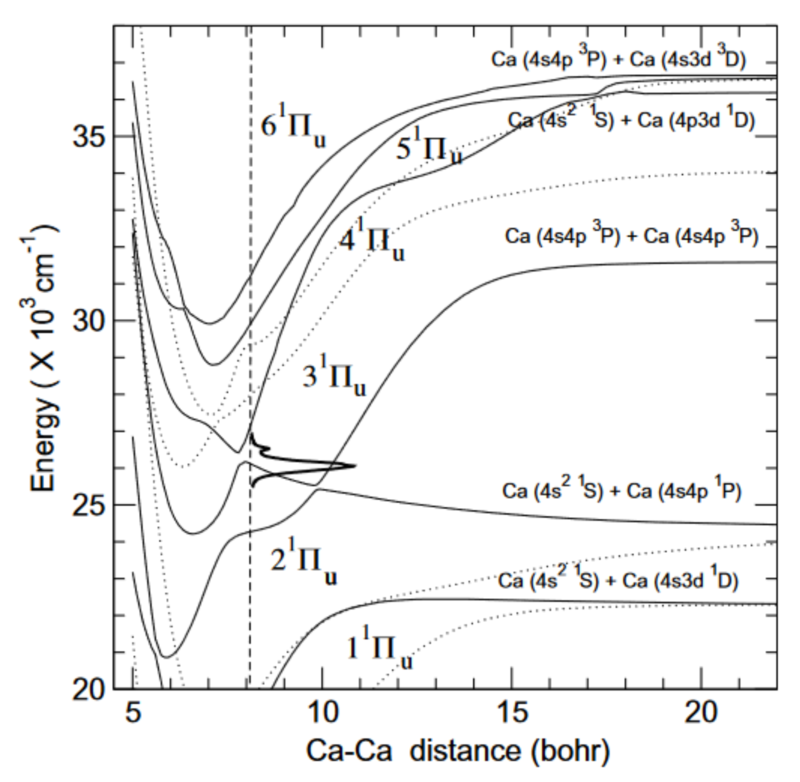 The latter is interpreted from ab initio calculation and analysis of the adiabatic states of Ca2 up to doubly excited asymptotes Ca(4p3d1D) + Ca(4s21S) and Ca(4s3d3D) + Ca(4s4p3P), and the relevant dipole transition moments. The bimodal structure is assigned as resulting from the avoided crossing between adiabatic states 31Πu and 41Πu, reflecting the mixing of doubly excited configurations and absorbing singly excited configurations. Spectroscopic measurements provide fluorescence and excitation spectra of a single barium atom codeposited with xenon atoms on argon clusters of average size ≈2000. The spectra are studied as a function of the number of xenon atoms per cluster. The excitation spectrum with ∼10 xenon atoms per cluster is qualitatively similar to that observed when no xenon atom is present on the cluster. It consists of two bands located on each side of the 6s6p P1−6s2 S1 resonance line of the free barium. 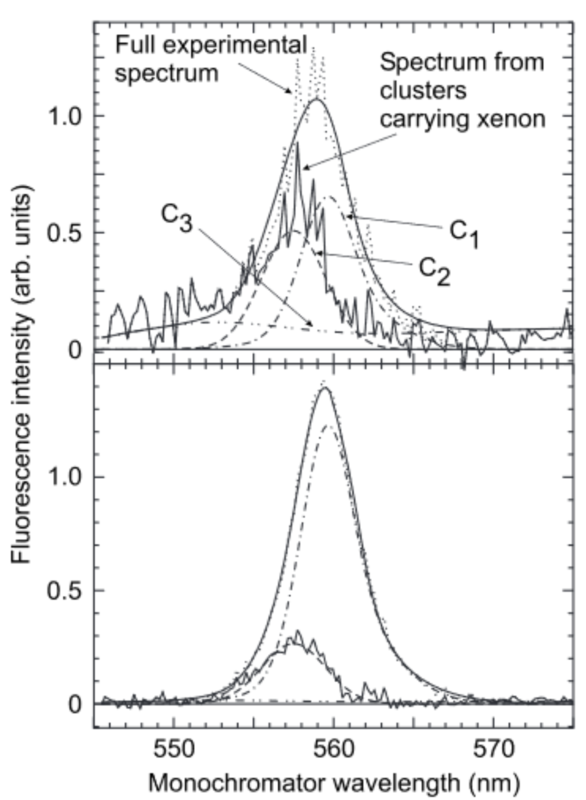 In contrast, the fluorescence spectrum differs qualitatively since a barium-xenon exciplex is observed, which has no counterpart in xenon free clusters. In particular an emission is observed, which is redshifted by 729cm−1 with respect to the Ba(6s6p P1−6s2 S1) resonance line. We have studied the chemical reactivity of the alkaline earth metal atoms Ba and Ca with N2O deposited on van der Waals (argon, nitrogen, methane, and neon clusters) in the case of Ba and on argon and helium clusters in the case of Ca. The first reaction forms BaO from 1 Ba and 1 N2O except at high Ba coverage where another channel is open yielding Ba2O. With Ca, the reaction 1:1 is hindered and the chemiluminescence comes from the reaction between 2 Ca and 2 N2O forming 2 CaO molecules. We study how the laser induced fluorescence spectroscopy of the calcium dimer deposited on pure helium clusters is modified by the addition of xenon atoms. 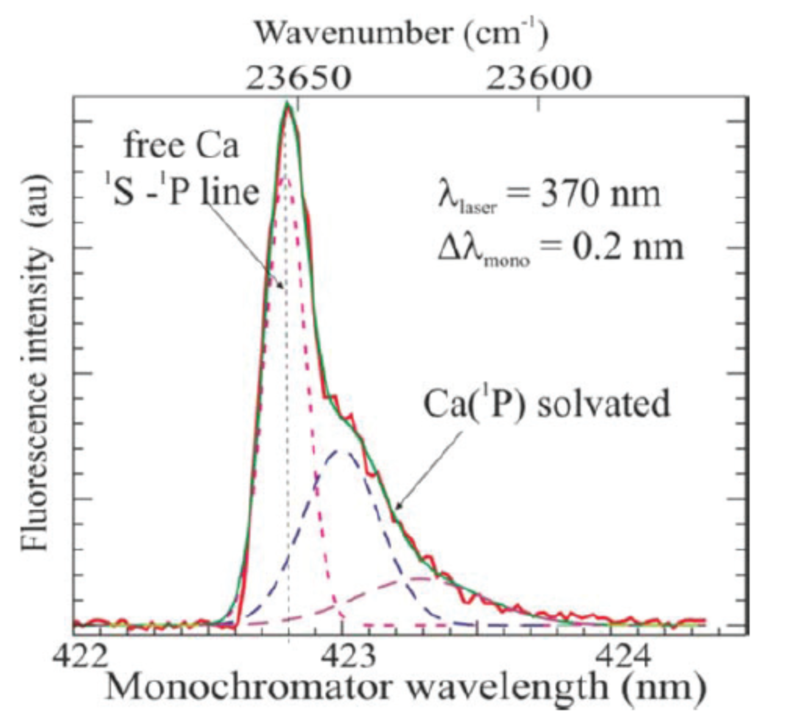 In the wavelength range between 365 and 385 nm, the Ca dimer is excited from its ground state up to two excited electronic states leading to its photodissociation in Ca(P-1)+Ca(S-1): this process is monitored by recording the Ca(P-1) fluorescence at 422.7nm. One of these electronic states of Ca-2 is a diexcited one correlating to the Ca(4s 4p P-3) + Ca(4s 3d D-3), the other one is a repulsive state correlating to the Ca(4s 4p P-1) + Ca(4s(2) S-1) asymptote, accounting for the dissociation of Ca-2 and the observation of the subsequent Ca(P-1) emission. On pure helium clusters, the fluorescence exhibits the calcium atomic resonance line Ca (S-1 <- P-1) at 422.7 nm (23652 cm(-1)) assigned to ejected calcium, and a narrow red sided band corresponding to calcium that remains solvated on the helium cluster. When adding xenon atoms to the helium clusters, the intensity of these two features decreases and a new spectral band appears on the red side of calcium resonance line; the intensity and the red shift of this component increase along with the xenon quantity deposited on the helium cluster: it is assigned to the emission of Ca(P-1) associated with the small xenon aggregate embedded inside the helium cluster.